Welcome to the ScrapThat! January Kit Reveal and Blog Hop!! 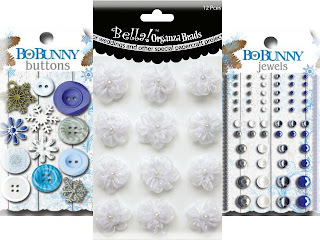 I am very excited to be Guest Designer for the January kit, which is filled with wonderful Bo Bunny papers and products, plus fantastic embellishments! 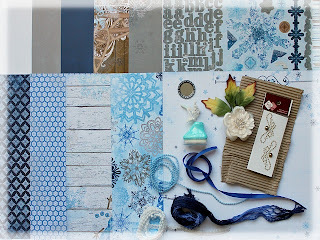 The “Powder Mountain” collection combines shades of blue, white and grey into beautiful frosty wintery papers. Here are 3 layouts I created…. I pulled out some older photos of my children playing outside and scrapped them for these first two layouts. When my teenagers were young children, it was so easy to get a shovel into their hands…and they even thought clearing the driveway after a big snowfall was fun! 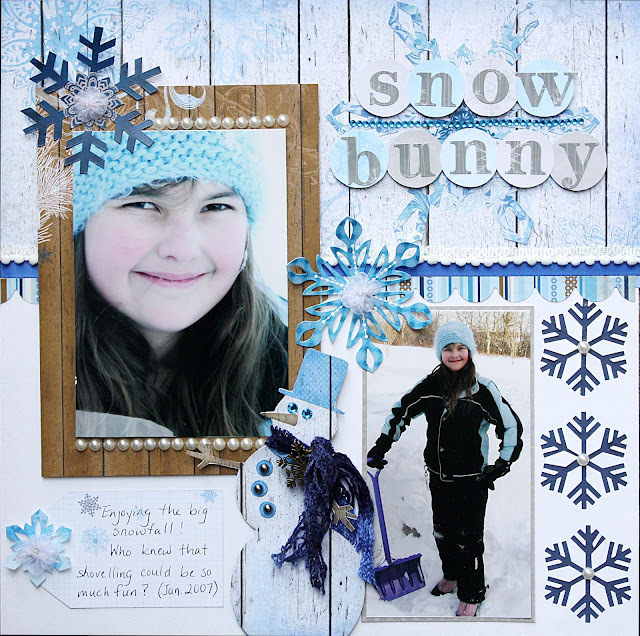 My last layout features a photo of my youngest daughter, which I took during our first blizzard of this winter, a couple of months ago. I just love it when those huge snowflakes drift down from the sky. I used Amarylis’s wonderful sketch for this design. Later in January, I will share all of the details and techniques in these layouts with you over at the Scrap That! Blog. If you came here from Scrap That! then you are on the right track! Don’t forget to check my secret word at the bottom of this post! 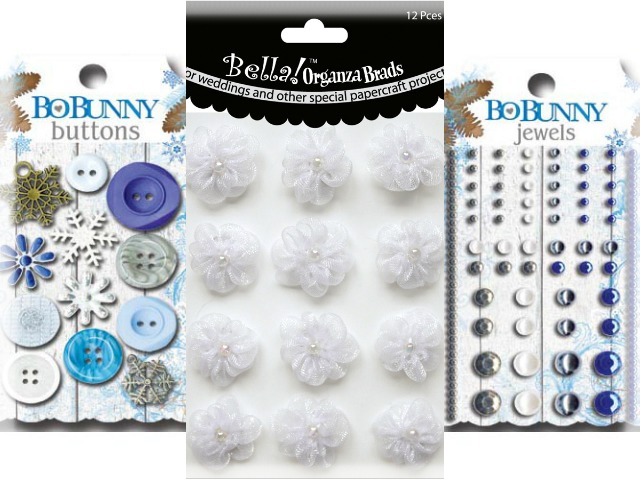 but BoBunny is also joining us on our blog hop this month!! Featuring BoBunny’s “Powder Mountain” line, this kit matches crisp whites and blues with the earthiness of warm browns. When you open the box, the sparkles and textures just long to be played with! 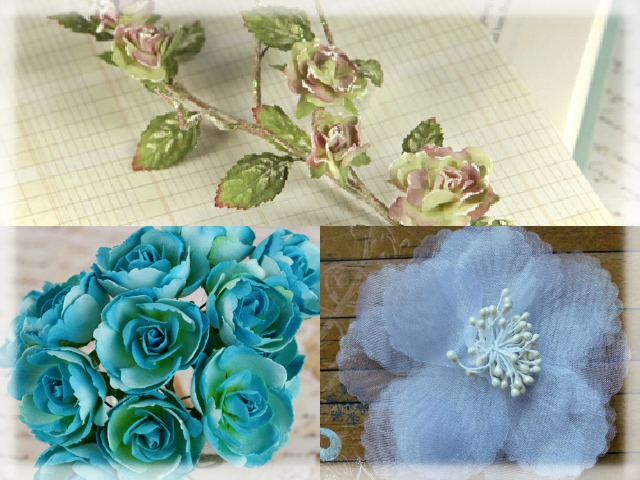 Included are flowers from Prima and leaves from WOC, jewels and buttons from BoBunny, multiple ribbons from May Arts and more! 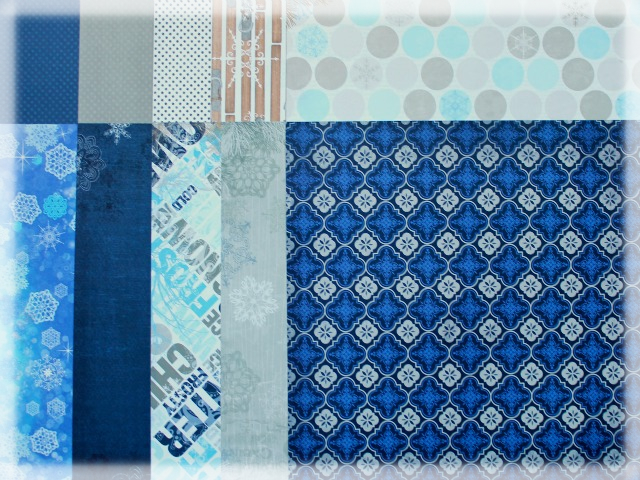 Don’t just think winter, as our DT will show you, this kit offers myriad layout possibilities! Look what Amarilys created for January’s sketch challenge! Our Blog Hop features 11 fantastic blogs including our Design Team. 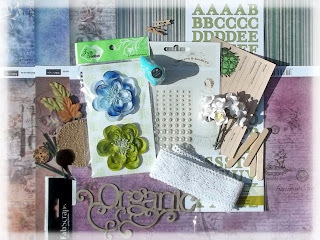 * Visit each blog listed on the hop to see what each designer has created using this month’s kit and sketch (comments are very much appreciated). * You must become a FOLLOWER of each blog along the way and LIKE us on our Facebook Page! * For you last stop on our Blog Hop return here to the ScrapThat! Chat Blog. Shipping costs will be invoiced via PayPal unless you are a kit member, then your prize will be shipped with your monthly kit. For your final stop, return to the ScrapThat! Blog to let us know you have completed the hop. All of us at ScrapThat! wish you and your families a Happy New Year! We are looking forward to seeing a whole host of new layouts! « A Merry Christmas to All! Such beautiful creations…I was so looking forward to seeing them! Looks like we had the same idea in dressing up that snowman! Thanks for joining us…your layouts are very inspiring! Your layouts are awesome, my fav is the one of your daughter and the snow! TFS! Thanks for being our gdt! These pages are lovely and am looking forward to th details! We are so excited to have you as our GDT this month! Your creations as always are wonderful. I so love the way you’ve used the corrugated cardboard for your window! Great layouts! Love all those snowy colors with you awesome photos! gorgeous Los my dear friend! I especially love that window on the last LO! you are soooo creative! I love the cardboard window and the snowflakes. This is just lovely. Fabulous layouts! 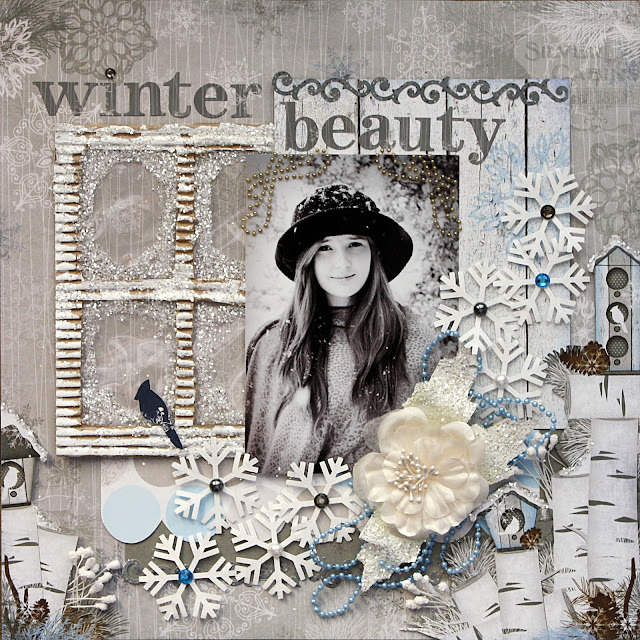 Love the Winter scene in your Winter Beauty layout! Soo beautiful! Thanks for sharing! Beautiful pages!!! love the last one!! TFS! I love the black & white photo on the Winter Beauty layout. The subtle hints of color just make it spectacular! Winter Beauty is gorgeous Kelly! Oh I love winter layouts and yours are gorgeous! That winter beauty is just AMAZING – gorgeous creations! Kelly, This is my first time on your blog and I LOVE your designs. You add such interesting little details…your pages are just beautiful to look at. No wonder you are a teacher. I have added you to my emails so that I don’t miss a one of your blog posts. Beautiful layouts (and beautiful children too)! Love these BoBunny papers and embellies. Love all your beautful layouts! Amazing job and congrats! Congrats Kelly! Very beautiful pages, LOVE that snowman! Hi Kelly! I already congratulated you on Facebook, but wanted to HOP by your blog to congratulate you again!!!!!! You are amazing! I love your pages so much!!!! Like I said before, I wish I lived closer so that I could attend your classes, my talented friend! Your pages are WONDERFUL. Magical. I love the way you’ve captured your children in such a lovely, loving way. Happy, Wonderful New Year!!! Fabulous work! I love how you embellished the snowman and your frosty window is so creative. Thanks for the inspiration! Kelly beautiful LOs, congrats on your GDT!! for some reason I thought I was your follower since I see your work everywhere and since we are both in Canada but I was wrong. only now I am but never late than never. I wouldn’t be surprised I’ve met you in ScrapFest if you’ve ever been in Oshawa or Kitchner. If not I’ll make a point of meeting you next time!! Beautiful layouts, thanks for sharing! Hi Kelly and Happy New Year!! 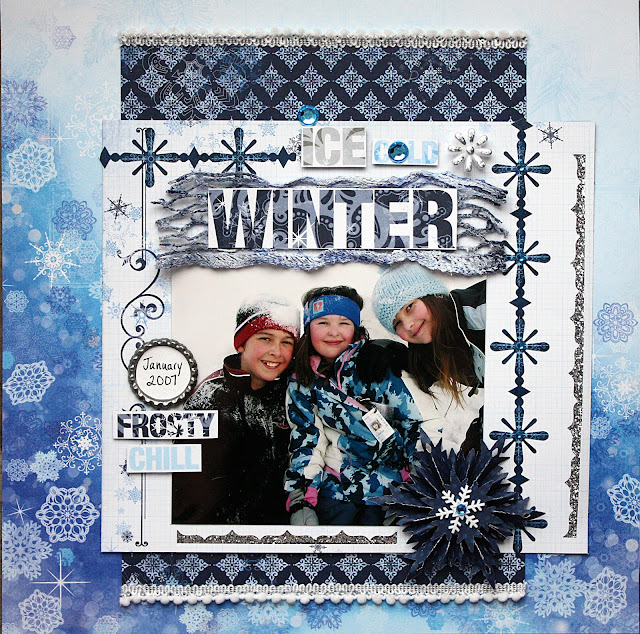 You made such beautiful pages with that kit…wintery and cozy all at the same time! Thank you so much for all your support and encouragement my friend!! I wish you and your family a happy and healthy 2013!! Congrats on the gig, Kelly. You did beautiful work with this kit. I especially love the last layout. You rocked the neutrals. BoF looks all grown up!